Between the 8th and 11th centuries Denmark was the cradle of the Vikings. Colonization of the largest islands in the Baltic Sea required boatbuilding expertise and this combined with understanding of navigation has made the Vikings a marine fighting and colonisation power. Viking boats reached even the coast of North America. Danish ancestors settled in Norway, Greenland, and most of the islands located in their way and these lands for centuries were more or less controlled by Denmark. 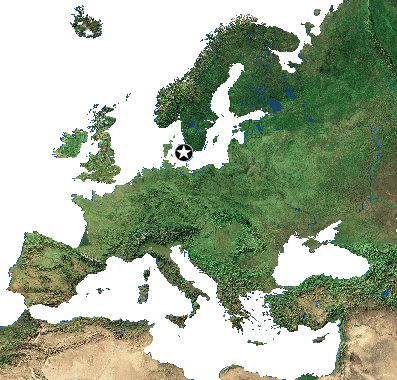 The adoption of Christianity in the 10th century placed Kingdom of Denmark on the map of Europe and the expansion in the Baltic Sea basin began. In 1397 through the Kalmar Union Denmark united practically all the Scandinavian Peninsula in a strong military alliance and thus the golden age of Denmark began. Later history conatins a gradual loss of possessions on the Baltic Sea, a constant struggle to keep the borders with Sweden and the German dukedoms, as well as eventual loss of Norway and Iceland. Today Danish motherland is limited to the Jutland Peninsula and islands of the Danish Straits, but overseas Faroe Islands and especially Greenland make Denmark 12th largest country in the world by area. Denmark is a founding member of NATO and since 1973 a member of the European Economic Community.